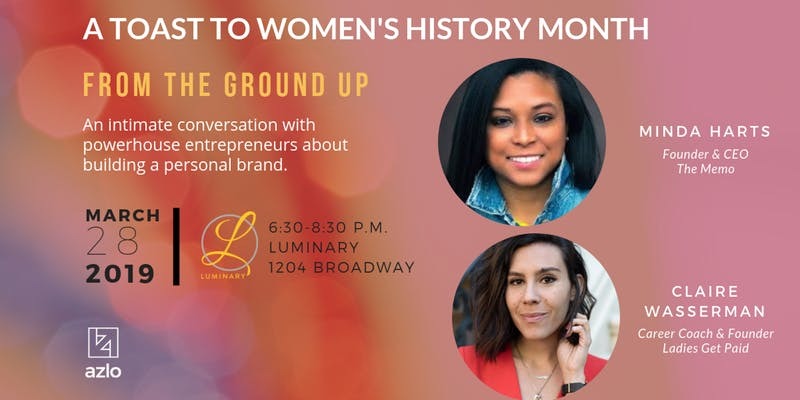 Join us at the Luminary in NYC for a conversation with successful women entrepreneurs who have built a business with a mission. Claire Wasserman is a career coach and CEO of Ladies Get Paid, dedicated to helping women thrive at work. Claire has collaborated with Nike, WeWork, and Squarespace and was chosen as one of Bumble’s 100 Most Inspiring New Yorkers. She is on the Well + Good Council, and is the producer and host of the podcast, Lady Talk. Minda Harts, founder of The Memo, a networking and career site aimed at preparing Women of Color for their seat at the table. Minda is the author of the upcoming book TheMemo from Seal Press and host of the podcast #Secure the Seat. **Light food and drink will be served.